With Christmas fast approaching and family rapidly descending, it pays to have a plan for Christmas morning. A workable plan. Not “I think I’ll make eggs benedict for 12 people”. Enter the strata — a simple make ahead breakfast that’s hearty, eggy, cheesy, vegetable-laden and that you make the night before! Bake it the next morning – simple. This spinach and mushroom strata is entertaining nirvana! Since this is a veggie-centric, serving it with a rash of bacon, or porky sausages is only logical. If you really have a crowd coming, I’d recommend doubling this recipe and serving it beside this easy holiday ham – which takes all of 10 minutes to prep. 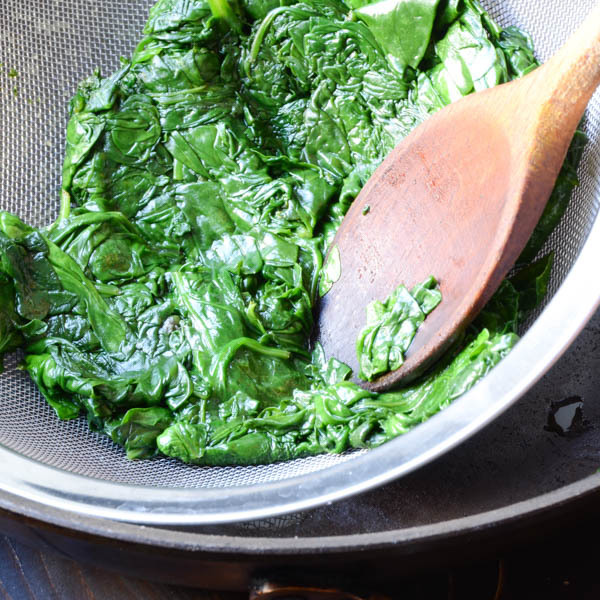 The same thing goes for the spinach — whether you’re using fresh or frozen, make sure that you’ve removed all of the excess liquid. The rest is easy peasy. Mix the eggs with milk, some stale bread and cheese and assemble the day before. 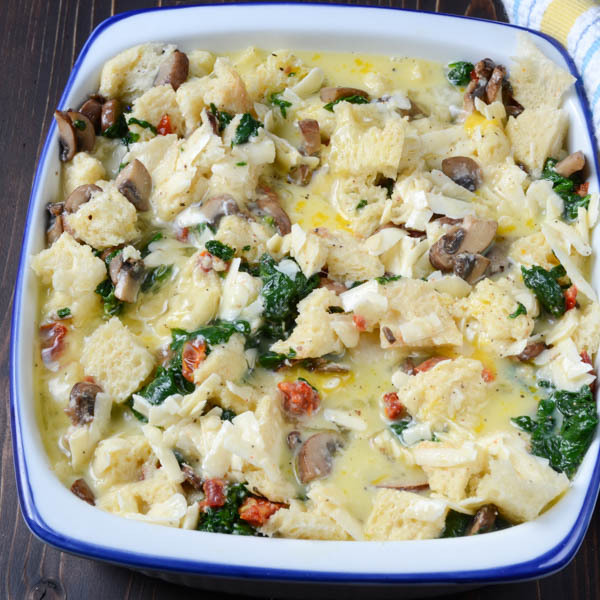 This spinach and mushroom strata bakes up beautifully the next morning while your sipping your coffee and watching the kids tear into presents. This is also ideal for a festive holiday brunch, serve it with plenty of Mimosas and Bloody Marys’ to amp up the merriment! One of the simplest ways to entertain overnight guests is with a delicious strata for breakfast. It assembles in no time and is ready to bake while you're having your coffee the next morning! In a non stick skillet with a lid, heat over medium high heat until pan is hot. 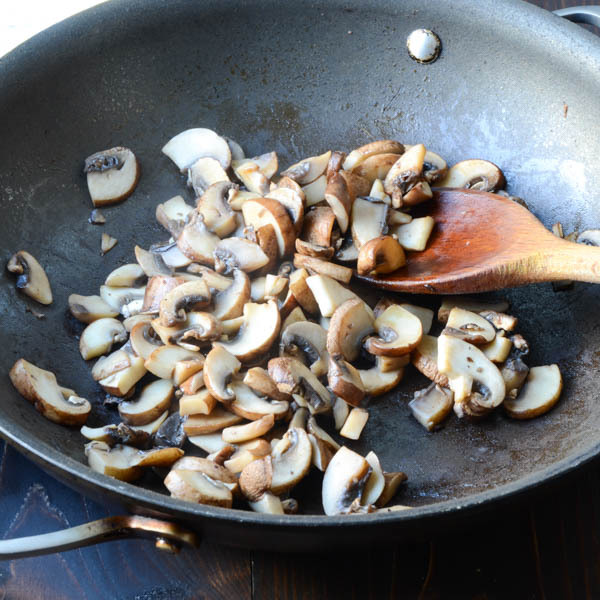 Add sliced mushrooms and 1/4 teaspoon kosher salt to the skillet and stir once or twice. Put the lid on the pan and let the mushrooms give off their liquid for a minute. Continue to check the mushrooms and stir every 30 seconds or so until all of their liquid has been given up and mushrooms are slightly browned. Transfer the mushrooms to a medium bowl. Place spinach in a clean dish towel and squeeze out all the liquid and add it to the mushrooms. 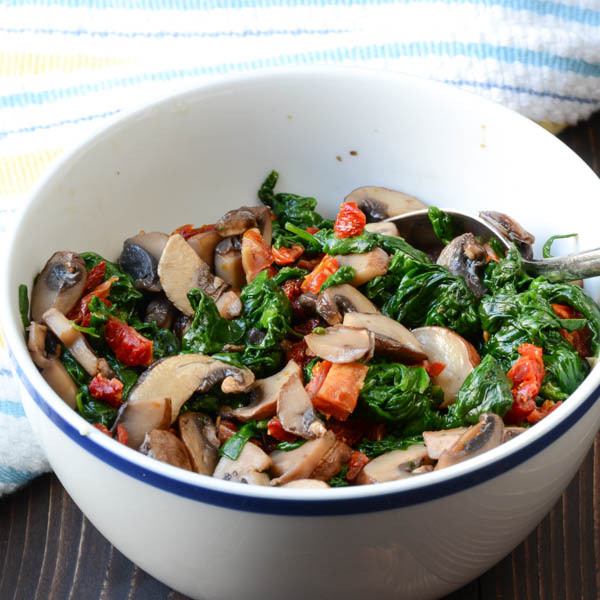 Toss the sun-dried tomatoes with the spinach and mushrooms, set aside. 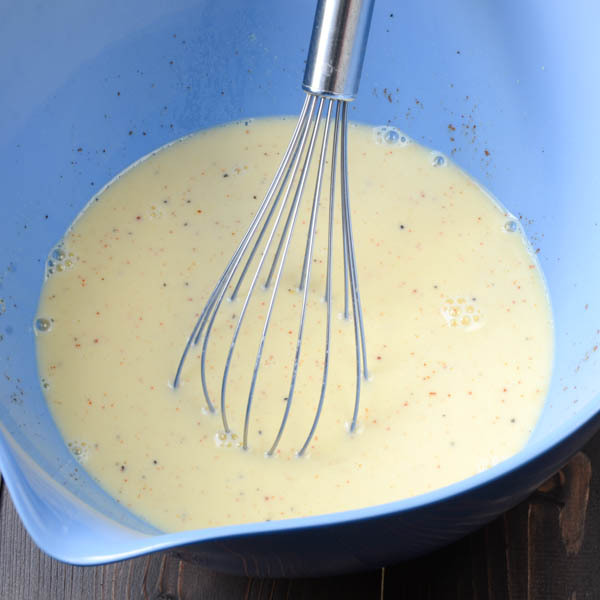 In a medium bowl whisk together the eggs, milk, mustard powder, cayenne pepper, garlic salt, black pepper and remaining 1/2 teaspoon kosher salt. Stir in the cheeses. Spray a 4-5 cup casserole dish with nonstick spray. Add 1/3 of the bread cubes. Sprinkle with half of the vegetable mixture. Pour 1/3 of the egg and cheese mixture over the vegetables. Top with 1/3 of the bread cubes and the remaining half of the vegetables. Top with the remaining bread and pour the rest of the egg/cheese mixture evenly over the bread. Use your hands to press the bread lightly into the mixture to soak up the egg custard. Top with a sprinkling of gruyere and parmesan cheese. Cover and refrigerate for 8 hours or overnight. Take the strata out of the refrigerator half an hour before you're ready to bake. Preheat the oven to 350 degrees. Bake strata for 45-50 minutes until puffed, browned and bubbly. Let it rest for 10 minutes before serving. This recipe sounds delicious! I’m going to try it for a Bridal Brunch in the North Carolina mountains. All the girls are going to do yoga, in the garden, and then brunch on the back porch! What would you suggest I serve with this veggie strata? All of the guests are quite healthy eaters. Well, my go to with this strata has always been a baked ham — feeds a crowd and its very economical. Along with a green salad, fresh fruit and plenty of sparkling wine — that sounds like a party to me. I think I used a 7×9″, but look through your casserole dishes and see what it will fit into comfortably. 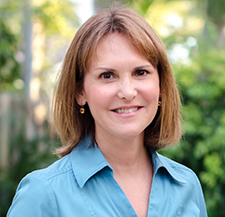 The strata should fill to about a 2″ depth. Can it be frozen before baking? Would you have to defrost before putting it in the oven? That’s an interesting question, I’ve never tried it. My initial inclination would be to bake it and THEN freeze it — reheat it in a low oven (300°) AFTER DEFROSTING. Oh that looks like such a fun breakfast for a crowd – love it! This looks so delicious! Love that it can be made ahead for a special event breakfast. We all need a few of those make-ahead dishes in our back pocket, don’t you think? You always come up with the most beautiful and tasty recipes. I’m saving this recipe for next time that I have guests. You are very kind! Thank you so much — I hope you enjoy it! We make strata when we’re having a group over for breakfast or brunch, it’s easy and can be made ahead! The flavors in this sound unbelievable! 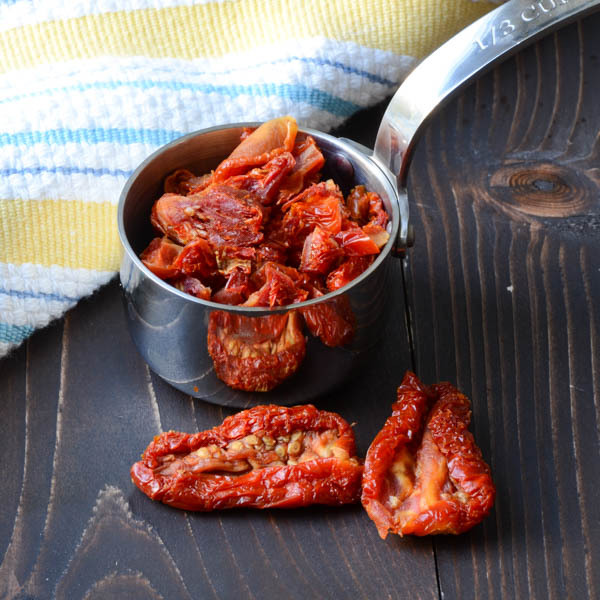 …and the addition of sun dried tomatoes?? Seriously, so good and so yum! Yes, the sun-dried tomato adds a sweet bite and it’s so good! Thanks — I’m so glad you like! This looks amazing! I am definitely making this for my next ladies’ brunch!! Pinning! It’s one of our favorites. Please let me know how you like it!